Published October 12, 2015 By Leisa Good This post may contain affiliate links. Regardless, I only recommend sites I've researched and/or used and trust. Would you like to work for a trusted name in retail and fashion? Do you like providing customer service and making each customer feel special? Are you interested in a work-at-home job with good pay and benefits? Well, then a familiar name to many—Neiman Marcus—might be what you are looking for. Unfortunately, the work from home positions tend to be location-specific so that you can train onsite. The locations vary. What is Neiman Marcus Direct Work From Home? Since the first retail store opened in Dallas, Texas in 1906, Neiman Marcus has been a trusted name in retail known for their high-end décor, fashion, and other items. With the work from home program, you would be taking both web and catalog orders for their customers. You would be using phone calls, live chats, and email to manage the customers' accounts. While you are allowed to work from home, it is an employee position with benefits. Even the Neiman Marcus DWFH takes customer service very seriously, and considers its employees the “Cornerstone” of its business. Cornerstone is what they call their production mentoring program. What Are the Work Requirements For the Neiman Marcus DWFH Position? What Are the Computer/Equipment Requirements to Work at Neiman Marcus DWFH? The computer and equipment requirements to work this position are very detailed. What is Training Like at Neiman Marcus DWFH? Because you are an employee and not an independent contractor, training is paid. The full-training for the remote customer service position is three weeks. The first and last weeks will take place onsite, led by an instructor. During the second week, you'll be practicing on the phones. The training will take place at their Irving, TX facility. So, you'll need to think it over and decide if three weeks of training, part of which takes place onsite, is something that you want to do. Seasonal positions are also offered from time to time and usually posted on Monster.com. The seasonal positions have a shorter training period of about 10 days. What Is the Pay Like at Neiman Marcus DWFH? The pay is $11 to $16 an hour based on previous experience. Payday is every two weeks via direct deposit. Neiman-Marcus claims scheduling is fairly flexible, and your hours could range anywhere from 16 to 40 weekly. The FAQ states they are not able to guarantee anyone 40 hours per week every week due to the fluctuation in call volume. What Are Some of the Benefits for the Neiman Marcus DWFH Position? The benefits are almost the same for the remote position as they are for the brick and mortar positions. Major medical insurance, dental insurance, life insurance, paid holidays, and 401(k) are all a part of the benefits package. You can go here to see their full list of benefits. 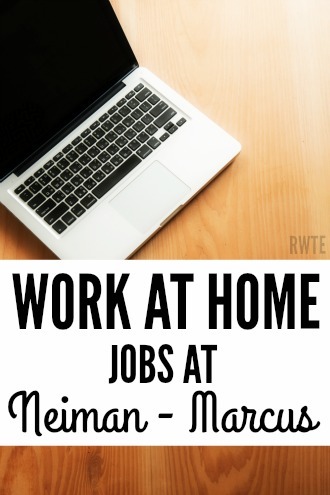 What Do Others Say About Working From Home For Neiman Marcus? It's hard to find much about the remote customer service position, since it's limited to just Texas. However, the other reviews were favorable if you'd like to read them from Glassdoor. How Would Interested Individuals Apply To Neiman Marcus DWFH? Visit Neiman Marcus' careers page to see if this position is available. Under search criteria, you'll need to use “work from home” as your keyword to locate the home-based jobs. Leisa Good has worked in the corporate world as well as side hustled and operated a virtual assistant business. She wrote the eBook on that one! She is a PFYP certified career coach, prayer minister, freelance writer, and the owner of Powerfully Purposed For Success. She empowers folks 50+ with the confidence and tools to live out the second half of their lives in full throttle and in full purpose.